Want to create your own checklists from scratch? See full instructions on how to create visuals, add text, use task pins, and much more. While we recommend you start with a sample checklist, you may want to create a new checklist entirely from scratch for some of your properties. You can also use a custom checklist to instruct your service providers on creating one-of-a-kind experiences for your guest, or to navigate a unique feature of a property. 4. Click Untitled Checklist to give your custom checklist a name. 5. Click the text box titled Checklist Description to write a summary of what’s included in this checklist and give instructions to your service provider about its use. To add a new photo slide, click “New Photo Slide” or the + sign in the lower left-hand corner. 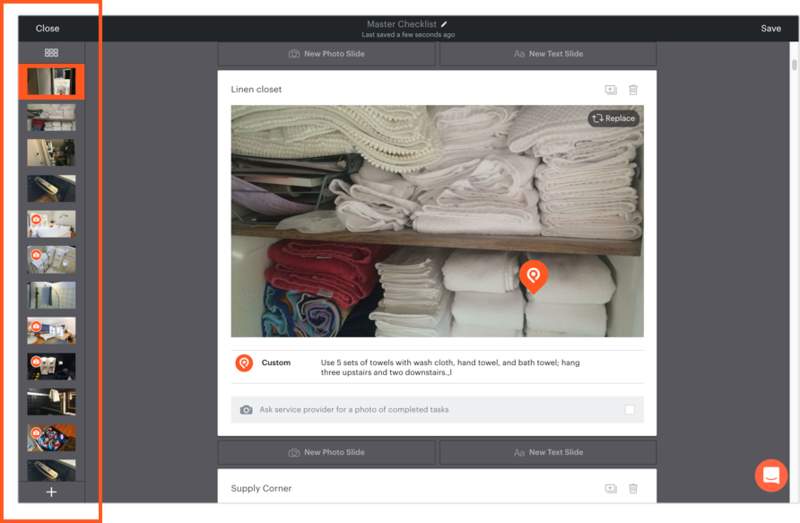 You can select any listing photos in your Photo Gallery, or upload photos from your computer. You can also create a new Blank Text Slide or Text Template by clicking the + sign in the lower left-hand corner.